As The World Looks Elsewhere, Haiti’s Disaster Is Just Beginning. Home » Actueel » Algemeen » As The World Looks Elsewhere, Haiti’s Disaster Is Just Beginning. Anthropologist Working in Haiti; Professor of NGOs. I returned from my shortest trip to Haiti last week, back to DeKalb, Illinois, an agribusiness hub, hosting Nestle and Monsanto processing plants. Most cornfields have been harvested. The Cubs won the world series for the first time in 108 years. Another of Illinois’ home grown, Hillary Rodham Clinton, has an 84% likelihood of being elected the U.S. first female president in a couple of days, per the New York Times. However, in terms of material damage – over 80 percent of houses destroyed, livestock, a season’s crops, not to mention trees dead – Hurricane Matthew is proving very devastating. This is to say nothing of urgent public health concerns like hunger and a spike in cholera, a disease U.N. troops brought to Haiti in 2010. Is it because unlike the earthquake, the extent of the damage wasn’t fully known at the outset? Is it that people andeyò – literally outside, in rural areas – and their lives don’t matter? The 2010 earthquake killed foreign troops and aid workers just as it did Haitian people, NGO and governmental professionals as well as residents of shantytowns. This time around, the deaths were Haitian, and rural at that. Is it that “Haiti” is being blamed for the missteps, failures, disappointments, and secondary damage (“Fatal Assistance“ or “humanitarian aftershocks“) from the 2010 humanitarian response? This lack of urgency is deadly. The real disaster — chronic hunger, food insecurity, and dependency — is yet to come. Along with four MA students from the State University of Haiti who had conducted research in the Grand’Anse and South provinces, I visited four fieldsites in Matthew’s wake last weekend. What struck us all was the sheer scale of the destruction. Three weeks following the hurricane and trees were still barren. Over and again people likened the damage to a forest fire. This wasn’t just one isolated area but the entire region of the country. We drove for four hours with no end in sight. Another common theme in our conversations with residents and local officials was the lack of capacity or interest from the central government in Port-au-Prince and international agencies. Community organizations and elected mayors alike have been working on overdrive to attempt to meet residents’ needs. But time and again they reported frustration at the lack of support. The Ministry of Education declared that on November 7 schools must reopen. This would be a good goal, said Pestel mayor Evil Lavilette, if the Ministry had provided local governments with necessary support. Of the 50 private schools in Pestel, the Grand’Anse’s second largest town, only one was functional. In addition, tens of thousands of people are still staying in schools as emergency shelter. Either a region’s school children will be held behind or tens of thousands will be forced to battle the elements. 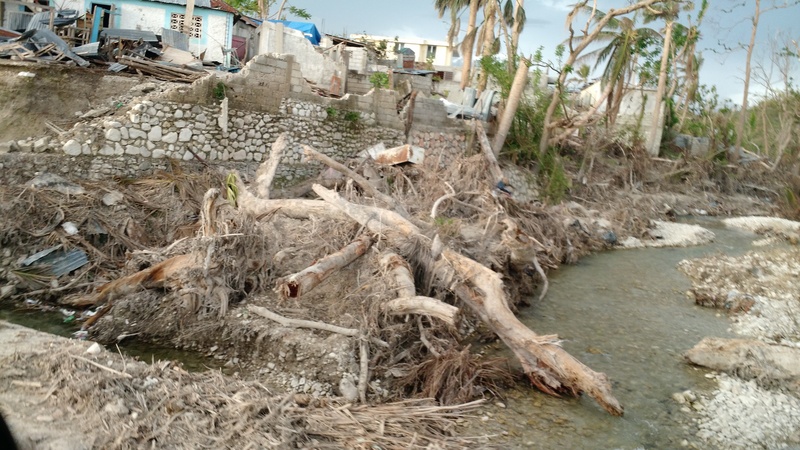 Fortune Odeve, a community organizer in the south coast Port-Salut, coordinating civil society response to the hurricane, was frustrated with the central government, particularly the lack of planning. “People in greatest need are not the ones receiving aid.” Water and electricity had not yet been restored. Electricity poles had not even been pulled off the ground in many places along the road. While this is a matter of grave concern, there was universal agreement that the biggest priority is to support farmers in the Grand’Anse and the South to get back to their fields. The “Grand South” was one of Haiti’s largest “breadbaskets,” helping Haiti feed itself. The loss to not just the region but the country is immense. Indeed, if the Cubs can win, anything seems possible. If even a fraction of people who attended Friday’s rally in Chicago knew the full extent of what happening in Haiti, or generally understood that our world agricultural system is intertwined, I truly believe that Haitian farmers can sow their seeds and be on the road to food sovereignty. Unlike baseball’s most beloved losers, I fear that Haitian people don’t have another chance at bat. Mark Schuller is Associate Professor of at Northern Illinois University and affiliate at the Faculté d’Ethnologie, l’Université d’État d’Haïti. Schuller’s research on NGOs, globalization, disasters, and gender in Haiti has been published in thirty book chapters and peer-reviewed articles. Schuller is the author or co-editor of seven books, including Humanitarian Aftershocks in Haiti and co-director / co-producer of documentary Poto Mitan: Haitian Women, Pillars of the Global Economy. Recipient of the Margaret Mead Award, Schuller is the board chair of the Lambi Fund of Haiti and active in several solidarity efforts.